The Ludlow Lions Club, chartered in 1943, gives their time freely to help those in need and less fortunate. Lions are men and women who volunteer their time to humanitarian causes in their local and world communities by conducting service projects and raising funds. We Serve is not only our motto, but our definition and philosophy. In 1927 Helen Keller challenged the Lions to be the Knights of the Blind on a crusade against darkness. We accepted that challenge and have dedicated this as our primary goal. 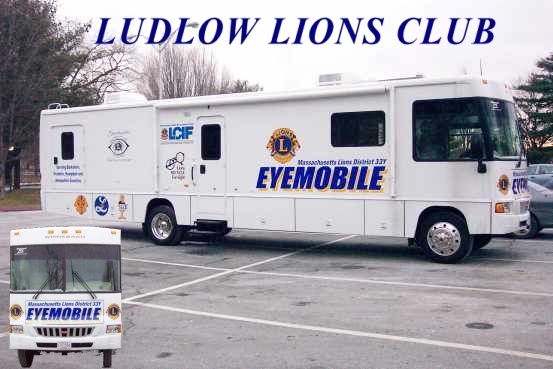 In an effort to fight preventable and reversible blindness the Ludlow Lions conduct free vision screenings and provide a vital service by facilitating the detection of low visionand eye diseases, such as Glaucoma, Diabetic Retinopathy, Muscular Degeneration. Lions continue to be the greatest army in the war of blindness. Membership in the Ludlow Lions Club is open to all men and women 18 and over. Members can be from any town or city, and need not reside or work in Ludlow. We would love to have you visit one of our meetings or volunteer at an event. For more information on the Ludlow Lions, drop us an email or give us a call. Follow us on facebook for timely updates.